In Science in the Parks and other programs, we often get asked, “Where did you get that?” or “How can we make this at home?” We try to compile answers to these questions in this stack of resources here. This is a recent project we’ve started to show you more about the behind-the-scenes and activities that you might want to do at home. This includes our slime and Oobleck that we feature on Feel It! day, as well as one version of a bubble recipe that we use on Move It! day. This is our most tried-and-true bubble recipe. It takes a few more ingredients, but it’s the one from which we get the really giant bubbles, especially on cooler, more humid days. The recipe we actually use for giant bubbles in the parks comes largely from ideas on this page. 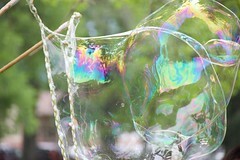 This wiki has lots of discussion about ingredients and inventive ways to make giant, long lasting bubbles. Because it’s a wiki, you can submit your own recipes as well!